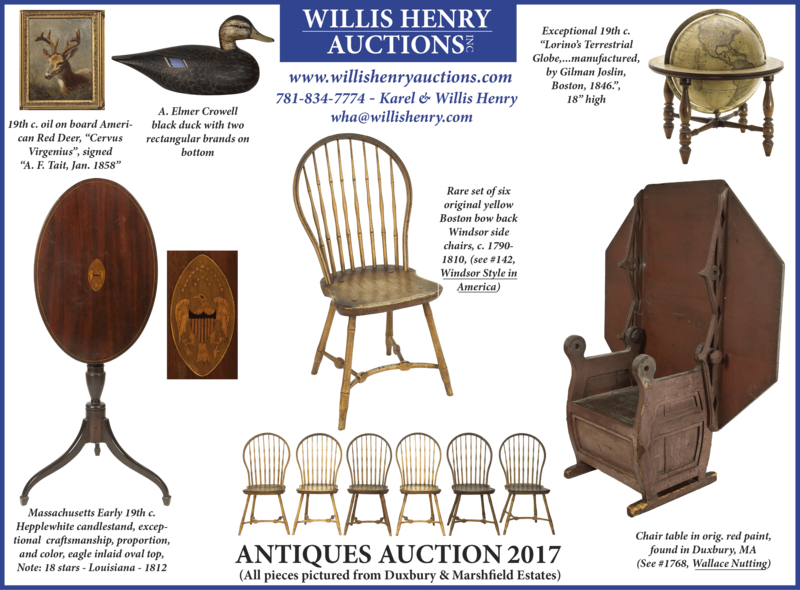 Antiques Auction - March 19, 2017 - Willis Henry Auctions, Inc.
From North and South Shore, MA estates. Furniture: Federal candlestand with inlaid eagle and shield, Santo Domingo drop leaf table, Early hutch table (see Nutting’s Furniture Treasury #1768), English Chippendale server, American tall case clock, 19th c. American huntboard, Rare set of six Boston Windsor side chairs (see Windsor Style in America), Chippendale chair stamped “J. Pulling”, other fine furniture including Mid-Century handmade furniture. Fine Art: Important 19th c. oils by A.F. Tait of a family of quail in a landscape (chosen by N. Currier for print in 1856), small oil by A.F. Tait of stag (“No 56”), many signed paintings, bronzes, prints and watercolors by artists such as Ralph Cahoon, etc. Accessories: 19th c. Terrestrial globe manufactured in Boston 1846; “Castle” spinning wheel; 18th c. tabletop tape loom with carvings “ANO 1737”, “STK” and “TEMARA”; Fine Silver, Jewelry; Oriental rugs; Signed coverlets, quilts, theorems, samplers, etc. ; Nautical items including a ship’s manifest, ship’s wheel, quarterboard from ship “Helena”; Whaling: tools, whale’s teeth, walking sticks and canes, lamps; Important Crowell decoy and sm. Decoy coll. ; Lighting devices; Early maps and engravings; Carvings of bear, deer with clock, etc. ; Chinese Export items; Dedham pottery; Early stoneware, etc.